Isn’t it great when a cat decides to let you adopt it? Hopefully there is no doubt that he/she finds you at least reasonably acceptable. Put it this way, if it scratches and bites in response to your attempted affections, you may not be the right match. But if you have had a successful cuddle, maybe there’s some purring involved, it’s likely the furball will be ok with moving in with you. But being tolerated by the cat isn’t the only thing you have to consider. 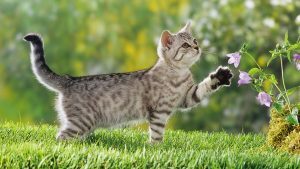 If you intend it to be an outdoors cat, will it be safe? Kittens especially fall easy prey to possum, coyote and assorted other critters. If animals such as these prowl your backyard at night, consider keeping your cat indoors. 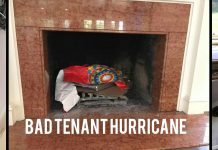 Seriously, from someone who once found the remains of his newly adopted kitten on the back porch, you don’t want to go through that. I punish myself for my naiveté. I thought the little fella would be safe. If it’s potentially dangerous, keep them in. 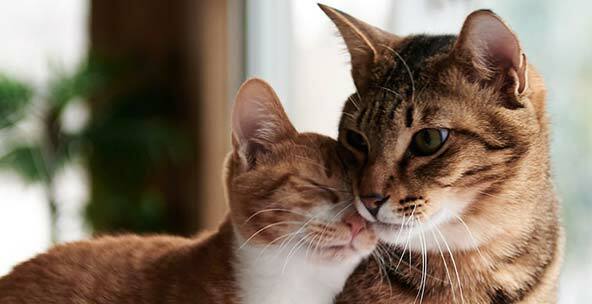 A practical concern possible cat owners have is for the fear that the pet will tear their home or apartment apart. Cats have claws. Claws do damage. If you have a nice new carpet, or a priceless display of vintage Star Wars toys, such a concern is valid. So let’s take a look at what’s to be done about it…. Your cat wants to mess with your stuff, it’s as if it has no respect for you or your property. Every space is fair game. They’ll hop from the counters to the top of the fridge and then bite the head off of your precious Han Solo action figure. And you better believe that they are assessing the damage as they rampage along. It’s like a sick joke to them. So how do you beat them at their game? 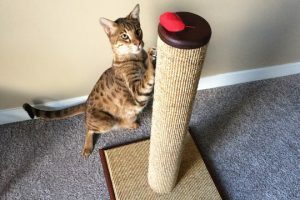 Commonly, cat owners purchase a scratching post with some success. But many cats have a wandering eye and have a hard time being faithful to the unit designated for abuse. And if that carpet looks good to the kitty, you may be looking for a new carpet. Furniture that you care for should be covered, and those collectibles – c’mon, don’t be stupid – put ‘em away. After a week or two you may have deduced that your pet is of even temperament, not likely to tear precious belongings to shreds. In that case, try a test. Display an action figure that you don’t care much for (like Jar Jar Binks) and see how he fares. 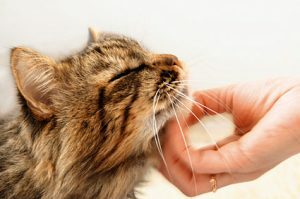 Generally, however, it’s best to keep potential breakables away – especially from new cats. There are pet-friendly fabrics that are extremely durable and easy to clean. Commercial materials are designed to withstand punishment; you may consider upholstering furniture with them. It may be expensive initially, but you won‘t have to replace it as often as you would if you stick with average and easily-torn fabric. Cat-repellent sprays have had some success. Motion activation means that you don’t have to take responsibility for the deterrent. It works on its own and is difficult to prove that the human is responsible. I just pretend that I know nothing about it. 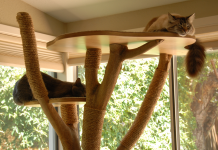 In many cases they have proven effective in training cats to stay out of certain areas. 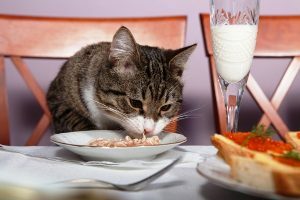 If your cat is like most, he probably likes to eat. You need to determine the best place for it to dine. It doesn’t have to be on the floor in the kitchen. In fact, it can be somewhere random and out of the way, as long as it’s easily accessible for our furry pal. Of course the area needs to facilitate frequent spill management. Ah, the litter box. Where do you put it? It’s going to stink, so if you’re concerned about offensive odors, you may want to reconsider having it anywhere near where you host guests. The bathroom is a common place for it, but unless it is vented very well, you’re looking at a serious olfactory problem. 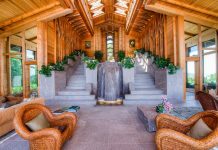 If you have a home with a basement, that may be an ideal solution. If you have none, an unused closet will suffice. And if you’re in a smaller apartment, an unused corner will be fine. And let’s be honest, the more you clean the thing the less it will smell. 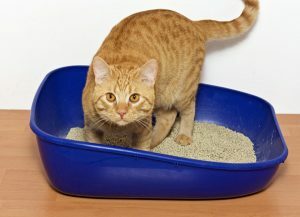 Be proactive and you’ll be proud to know you are creating the freshest environment for the feline. The cat won’t show you any appreciation, so let pride suffice. In the closet or nearby litter box corner, shelves should be about three feet off the ground. Don’t store fabrics of any kind on them. In fact, this is the perfect place to stack your plastic storage bins. Directly underneath, a berber carpet or deep tile is recommended to help prevent the spread of litter. And you know what would be cute? A pet entrance at the bottom of the wall or door made just for kitty. You should probably start building that. So are you ready to deal with shedding, dirt, scratches, odors and litter? Remember you need to respect the cat, it’s a free spirit and it does what it wants. It likely won’t respect you back. It might let you pet it sometimes, but for the most part it probably wants to be left alone. It’ll let you know.